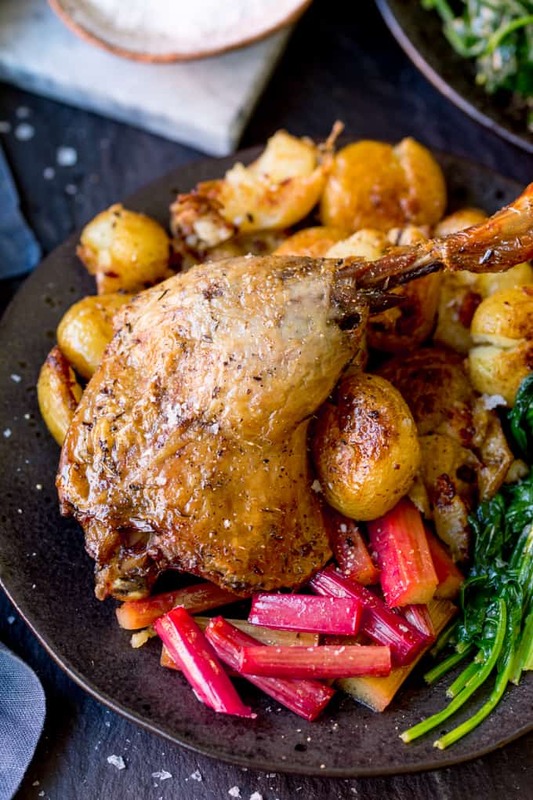 This Duck Confit with Roasted Rhubarb makes a fantastic dinner party or date night dinner. Check out how to make this easy crunchy crushed potatoes too! Rhubarb can be a little bit of a love/hate thing. It’s quite possible you were served green snot-looking, stewed rhubarb for school dinners if you’re in the hate team. I don’t blame you. That stuff still makes me shudder. But don’t rule out rhubarb forever. Delicately roasted, vibrantly pink rhubarb with a sprinkling of sugar is a whole different ball game. 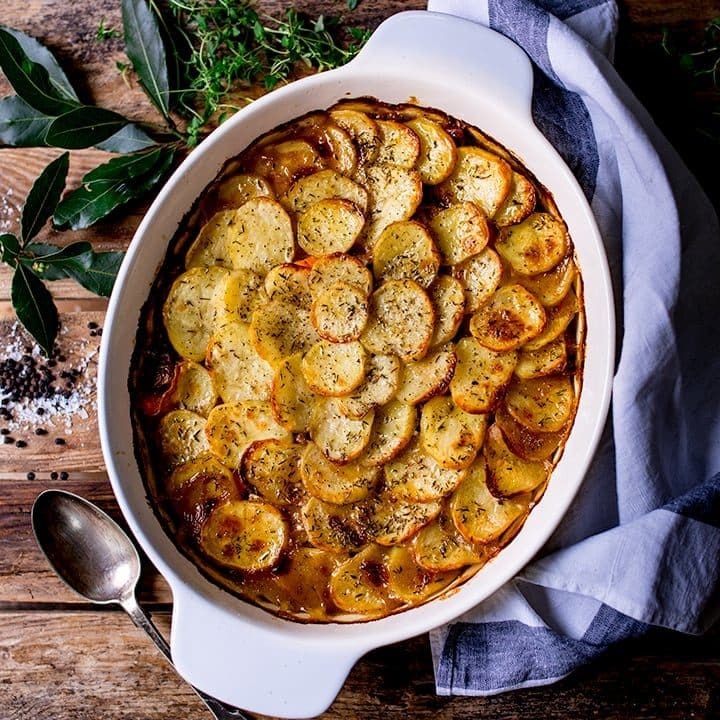 Serve up simply with a glug of thick cream, or maybe as part of a crumble (one of my grandad’s signature awesome puds) or serve it with something savoury. I find rhubarb works particularity well with rich meat such as pork belly or duck. And that’s what I’m doing today. 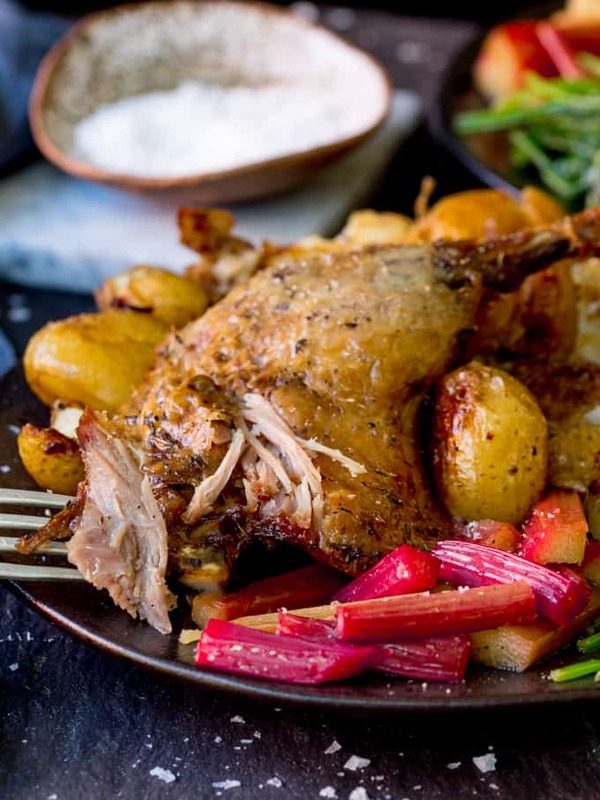 Tangy, juicy rhubarb, served with this oh-s0-tender confit duck. The duck takes a little bit of prep. You need to start the night before with a quick sprinkling of seasoning and overnight refrigeration to draw out some of the liquid. before being cooled and chilled in duck fat (for the ultimate tenderness). The finally stage is to roast the duck legs, so you get a lovely crispy skin along with that tender, rich meat. Most of the cooking is hands-off time. It’s only really the last 40 mins before you serve that you’ll be in the kitchen. Some recipes use extra fat to cook the duck in, but I don’t think it needs it. The duck is still tender and full of flavour. 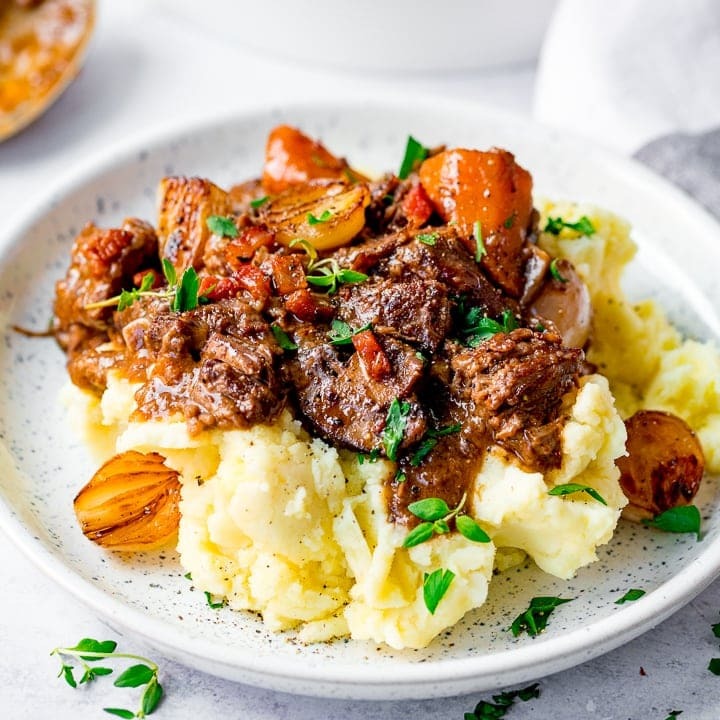 You should also be left with a good couple of tablespoons of duck fat – which is perfect to roast the crushed potatoes in. If you have any leftovers (the only way that’s happening in my house is to make extra! ), the duck makes a tasty salad topping the next day. I also used the leftover rhubarb juice to make a simple salad dressing. 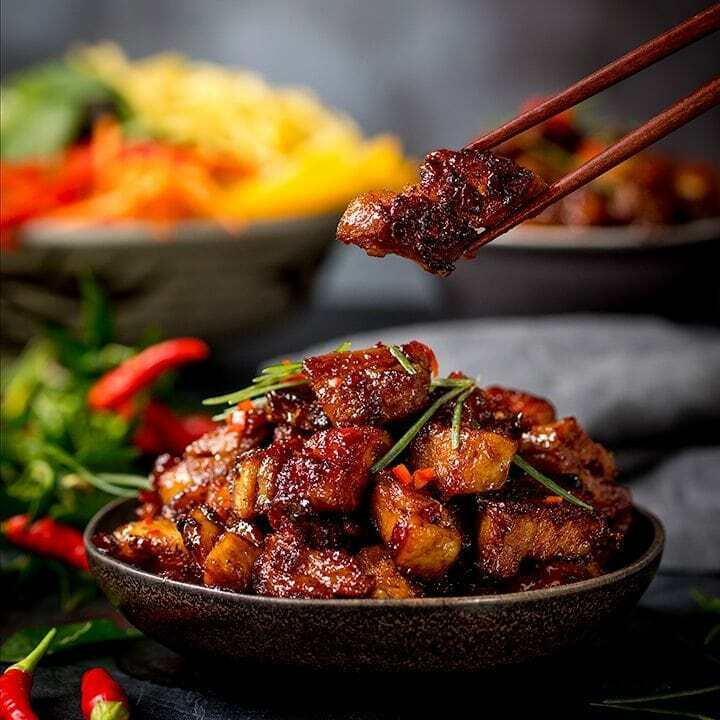 If you love duck, try my roasted ducked with plum sriracha sauce. Yes! This recipe is already gluten free. 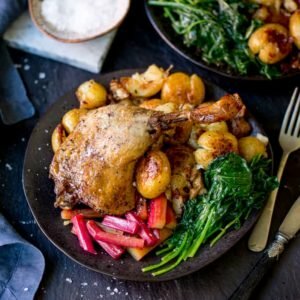 Can I make confit duck ahead? Yes, in fact it really needs to be made ahead. If you want to make it more than the one day ahead described in the instructions, then at step 7, make sure the duck is completely submerged in fat, before being stored in a sealed, air-tight container in the refrigerater. It should keep for a few weeks (and likely a lot longer) that way. Can I freeze confit duck? Yes, freeze at step 8. Then defrost overnight in the refrigerator before continuing with step 9. 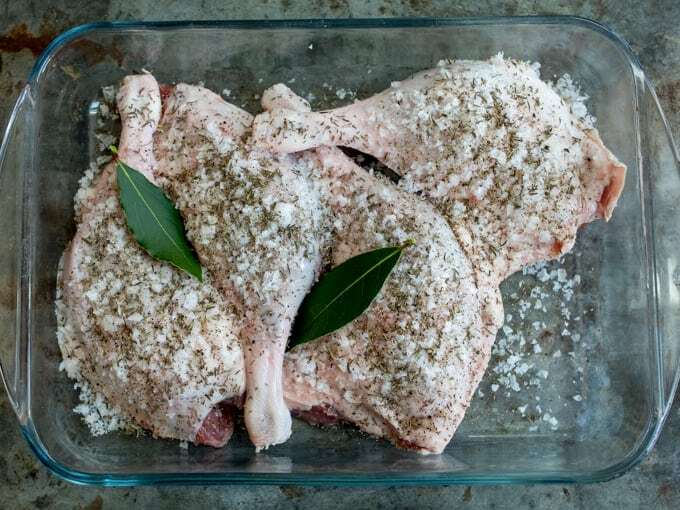 The night before, rub the salt, pepper, thyme, bay leaves and garlic on the duck legs, pack them together, skin side up on a single layer in a dish, cover in clingfilm (plastic wrap) and refrigerate. The next day, preheat the oven to 140C/275F. Gently wipe the duck legs down to brush most of the salt off. Don’t wash with water as this will wash off the flavour and make the duck legs too moist. Pack the legs closely together, skin side down, in one layer in a large baking dish. Pour the wine over the duck legs and cover in foil. Place in the oven to cook for 2 hours. During this time, the fat will start to render from the duck. Once cooked, the duck will be lovely and tender, and you can eat it right away if you can’t wait for the roasting stage! Once the duck is cooked, take out of the pan and leave the duck legs and pan of liquid to cool separately. 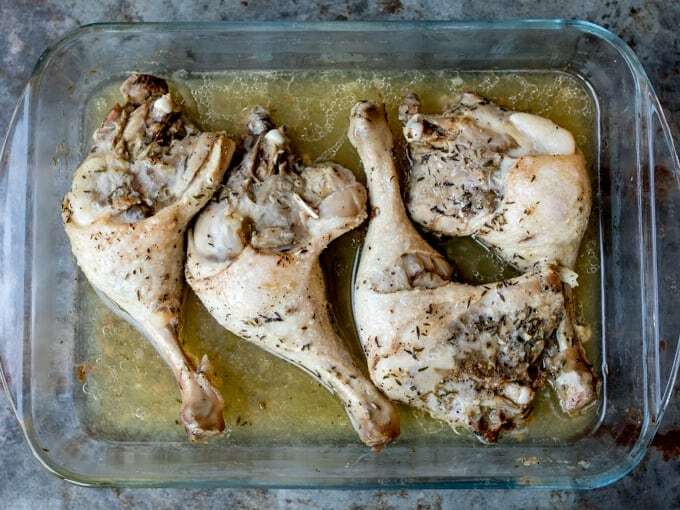 Place the duck legs in a bowl, skim the fat off the top of the cooking liquid and spread the fat over and around the duck. Cover in clingfilm (plastic wrap) and refrigerate for at least 2 hours (you probably won’t have enough fat to submerge the duck legs, but this is fine if you’re planning on eating the duck in the next day or two. If you want to keep the duck in the fridge for longer – i.e. a week or two, you can add in a jar of duck/goose fat. About 40 mins before you want to eat, preheat the oven to 220C/425F. Then put the whole baby potatoes in a pan, cover in water, bring to the boil then simmer for 15 -20 mins until tender (depending on size of the potatoes). Meanwhile, take the duck out of the fridge. Scoop two tablespoons of the fat from the duck and place in a metal baking tray. Place in the oven to heat up. Place the duck legs on a second baking tray, skin side up. Leave a bit of the cooking fat on them, but they don’t need to be dripping in fat. Drain the potatoes, once tender and squash them slightly with a fork. Transfer them to the baking tray that's already in the oven and carefully turn them over to coat them in the hot oil. Sprinkle with a good pinch of salt and pepper. 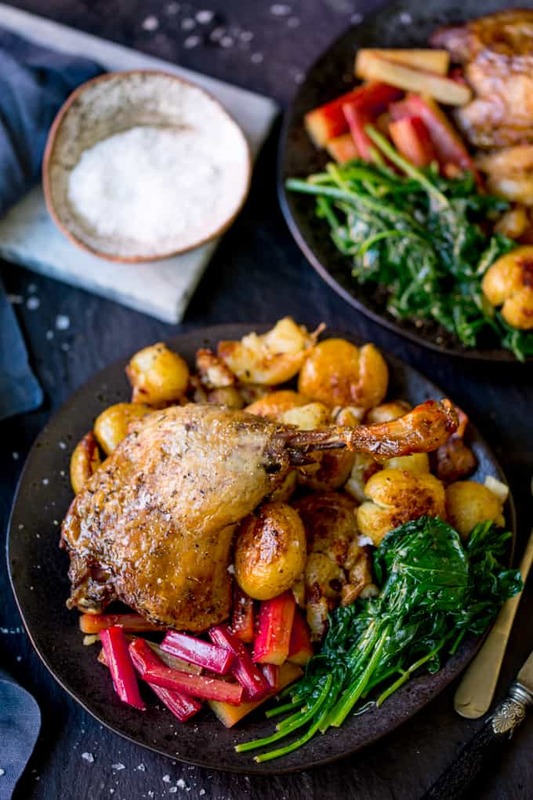 Place the potatoes and the tray with the duck legs in the oven for 15 minutes. Meanwhile, add the rhubarb and sugar to a small oven-proof dish and cover with tinfoil. When the duck and potatoes have been in the oven for 15 minutes, place the rhubarb in the oven. During this time, melt the butter in a large frying pan (skillet) over a medium-high heat. Add the baby spinach and cook for 2-3 minutes until wilted. Season to taste with salt and pepper. 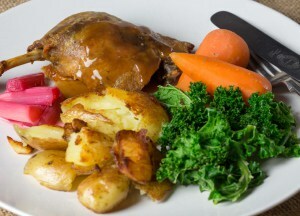 Divide the duck, potatoes, spinach and rhubarb between four plates and serve. If you have leftovers, these go well with a few salad leaves and some sliced spring onion. If you have any leftover rhubarb and/or rhubarb liquid, whisk this up with a tbsp of olive oil and some seasoning. You can also add a bit of balsamic or white wine vinegar if you like your salad dressing zingy. Yes, in fact it really needs to be made ahead. 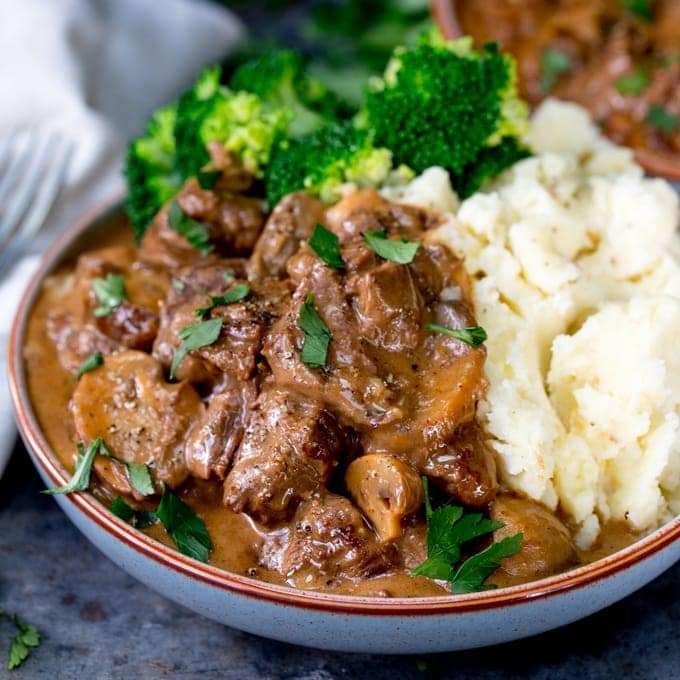 If you want to make it more than the one day ahead described in the instructions, then at step 7, make sure the duck is completely submerged in fat, before being stored in a sealed, air-tight container in the refrigerator. It should keep for a few weeks (and likely a lot longer) that way. This post was first published in March 2014. Updated in July 2018 with new photos, tips and updated instructions. I just love duck so much. And duck confit is so incredible! This might sound crazy, but I have never actually cooked with rhubarb before. I totally need to try this. Dave keeps asking me to cook duck, as he loves it. This sounds amazing, so we will have to give it a try. duck confit is the business! yours looks great! Thanks Mr Fitz 🙂 It tasted great too! Suggestion. 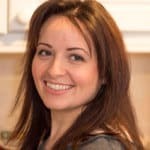 Are you able to include approximate cost of recipes? Bit of a difficult one, as I’d only be able to give a cost for shops in our area – so the prices may be incorrect for people viewing the blog in other countries. In this instance though, I found duck legs on offer at Waitrose – 3 packs of two duck legs for £10. The rhubarb is about £2.50 – £3.00 per 400g pack depending where you buy.